Today is my blog’s first birthday (!!) and for some reason I can think of nothing more appropriate to share with you than a story of total kitchen failure. I spend a lot of time writing about all the good food that makes its way off my stove and into our bellies, but every once in a while (aka on a semi-regular basis), things go terribly wrong. And there is almost nothing that frustrates me more. The wasted time, the wasted ingredients, the crushing weight of failure. It bums me out and makes me angry and basically ruins my day. So, you can imagine my disappointment Saturday morning when the white chocolate pudding (topped with a layer of blackberry curd!) that I was stirring on the stove top just wouldn’t thicken. I stirred hot milk and cornstarch for nearly forty-five minutes and nothing happened. Still, I poured the “pudding” into glass tumblers and tucked them in the fridge pretending that in an hour or two the liquid would magically thicken. It didn’t. But then, several hours later, something magical happened. A perfect lemon meringue pie emerged from the oven. 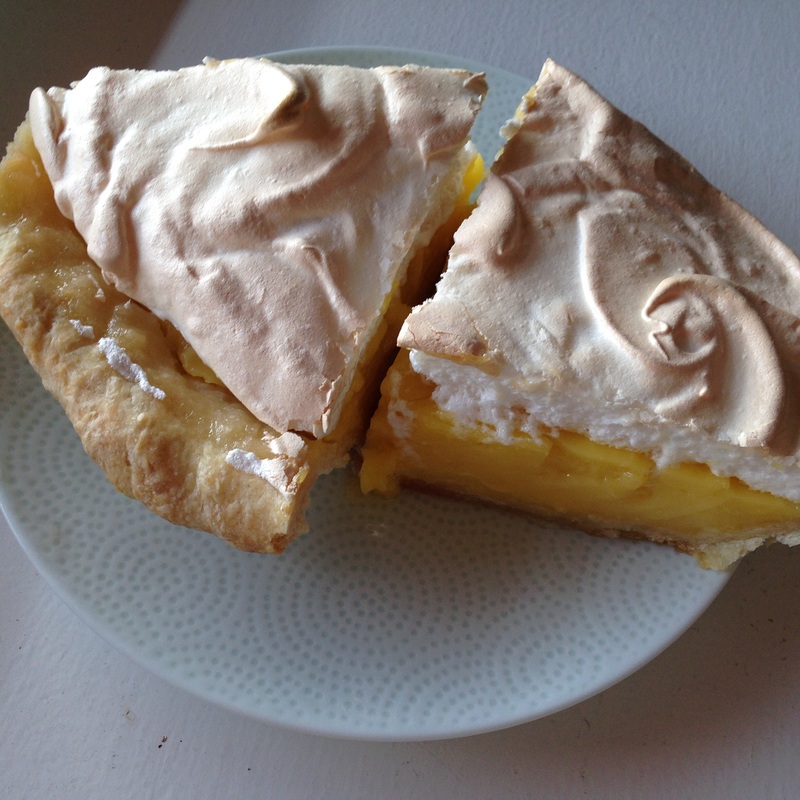 Even better than mom’s, with the richest, flakiest crust and the creamiest lemon curd topped with the purest cloud of meringue. I’m sure there’s a cheesy birthday blog lesson hidden in this baking adventure. You know, “If at first you don’t succeed, try something much harder instead.” Or maybe, if I’m being honest with myself, the real birthday message is a little less noble and a little more, well, me: “Don’t let anything keep you from dessert.” Happy birthday, blog! To Roll Out the Pastry: Lightly grease a regular 9-inch pie plate or coat with nonstick spray. If the dough is cold and stiff, let it warm up until slightly pliable but still cool to the touch. Generously dust it on both sides with flour. Roll out the dough between large sheets of baking parchment into a 13-inch round. Occasionally check the under-side of the dough during rolling and smooth out any wrinkles. (If the dough seems sticky or limp, place in the freezer for 10 minutes to firm up.) Gently peel off the top sheet of paper, then pat it back into place. Flip the dough; peel off the bottom sheet. Center the round, dough side down, in the pie plate. Gently peel off the remaining paper. Smooth the dough evenly into the plate and patch any tears, if necessary. Using kitchen shears of a pairing knife, trim the overhang to 3/4 inch. Fold the overhang under to form an edge that resets on the lip of the plate. Finish by fluting with your fingers or pressing into the edge with the tines of a fork. Prick the pastry all over with a fork. Loosely cover the pastry and place in freezer for 15 minutes or in the refrigerator for at least 30 minutes and up to several hours. To Bake the Pastry: Position a rack in the lower third of the oven and preheat to 400 degrees F. Insert a large square of aluminum foil coated with nonstick spray (or use nonstick foil) oiled side down into the chilled shell, smoothing the foil over the bottom and sides and folding it out over the rim to cover the pastry. Fill the foil with dried beans, spreading them so they extend up the plate sides. Set the pie shell on a rimmed baking sheet. Bake for 25 minutes. Carefully remove the foil and beans from the shell. Continue baking for 5 to 10 minutes longer, or until the shell is nicely browned all over. If the edges brown too rapidly, cover with strips of foil (or a pie shield). Transfer the pie shell to a wire rack. The pie shell will keep, stored airtight, at room temperature for up to 24 hours. Reposition the rack in the middle of the over and reduce the heat to 350 degrees F.
To Make the Filling: In a heavy, nonreactive medium saucepan, thoroughly whisk together the granulated sugar, cornstarch, and salt. Whisk in the water until the mixture is completely smooth. Whisking constantly, bring to a boil over medium-high heat. Lower the heat slightly and cook, whisking constantly, until very thick, smooth, and translucent, about 2 minutes. Remove the pan from the heat. Whisk in the butter until melted. In a deep medium bowl, whisk the egg yolks until blended. Whisk about 1/2 cup of the cornstarch mixture into the yolks until blended. Whisking vigorously, slowly add the yolk mixture to the cornstarch mixture until well blended. Return the saucepan medium-high heat and bring to a boil, whisking vigorously and scraping the pan bottom, until the mixture boils for a full 2 minutes. Don’t undercook, or the filling may thin out later. Remove from the heat and whisk in the lemon juice and vanilla. Strain the filling through a fine sieve into a microwave-safe medium bowl or a medium heavy saucepan. Whisk in the lemon zest. Taste the filling and stir in more lemon juice or granulated sugar, if desired. Cover and set aside. To Make the Meringue: In a completely grease-free large bowl, combine the egg whites, cream of tartar, and salt. Using a mixer on low speed (with a whisk-shaped beater, if available), beat the mixture until frothy. Raise the speed to medium and continue beating until the mixture is smooth, fluffy, and opaque, but still too soft to hold peaks. (Check by stopping and lifting the beater.) Immediately add the powdered sugar 2 tablespoons at a time, beating for about 20 seconds after each addition. Add the vanilla. Raise the speed to medium-high and beat for 2 1/2 minutes, scraping down the sides of the bowl as needed. Raise the speed to high and beat for about 1 minute longer, or until the meringue is fluffy and stands in firm but not dry peaks. Microwave the filling on medium power, stopping and stirring once, until piping hot, about 1 1/2 minutes. (Alternatively, reheat over medium heat, stirring, just until piping hot.) Turn out the filling into the pie shell, spreading to even the surface. Set the pie on a rimmed baking sheet. Spread about half of the meringue over the filling, making sure the meringue touches the pastry all the way around. Add the remaining meringue, mounding it slightly in the middle. Attractively swirl the meringue with a table knife or the back of a large spoon. To Bake the Pie: Bake for 12 to 17 minutes, or until the meringue is cooked through and evenly tinged with brown all over. For even browning, rotate the pan from front to back after 6 minutes. Transfer the pie to a wire rack. Let cool for at least 2 hours and then refrigerate until completely cold before covering; this will reduce the beading and weeping of the meringue. Let warm up slightly before serving. Using a large sharp knife dipped in hot water and wiped clean between cuts, cut the pie into wedges and serve. The pie will keep, covered, in the refrigerator for 3 to 4 days. In a large bowl, thoroughly stir together the all-purpose flour, cake flour, sugar, salt and baking powder. Sprinkle the chilled butter and shortening over the flour mixture. Using a pastry blender, forks, or your fingertips, cut in the fat until the mixture looks like coarse crumbs with a few bits the size of small peas remaining. Be sure to scrape up the flour mixture on the bottom of the bowl. Measure out 3 tablespoons ice water. Using a fork, lightly combine the water mixture with the flour mixture, tossing until the water is evenly incorporated and the mixture just begins to form clumps, 15 to 20 strokes. Be sure to reach down to the bottom to be sure the flour underneath is dampened. Check the consistency by pinching a small amount of dough between your fingertips; it should hold together smoothly and be moist but not soggy. If it is crumbly or dry, sprinkle over more ice water, 2 teaspoons at a time, tossing briefly with a fork. When the water is evenly incorporated and the dough is sufficiently moistened together when pinched, gather it up and firmly press it together with your fingertips into a smooth, dense mass. Flatten it into a 5-inch disk. Wrap in plastic and refrigerate for at least 45 minutes and preferably 1 hour. The dough can be refrigerated for up to 2 days or wrapped airtight and frozen for up to a month; thaw in the refrigerator before using. Roll and bake as directed in the individual recipes.